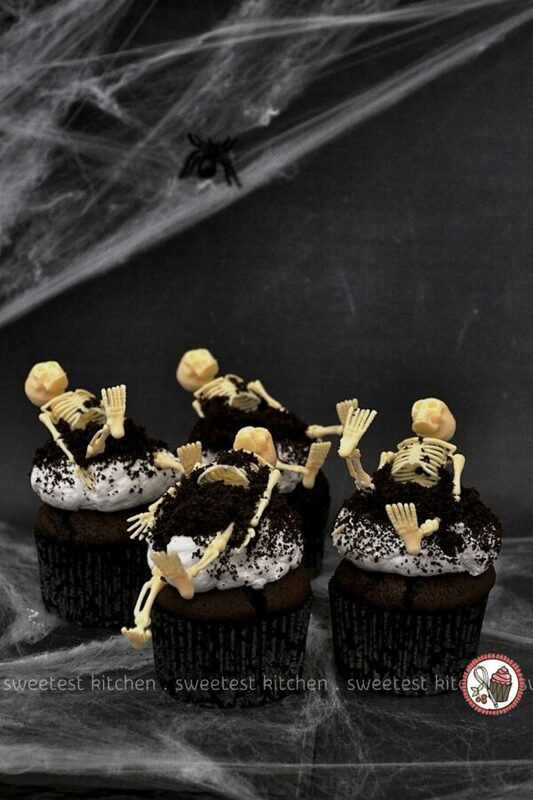 “… and grizzly ghouls from every tomb, are closing in to deal your doom…” These Halloween cupcakes totally remind me of Michael Jackson’s song “Thriller”! 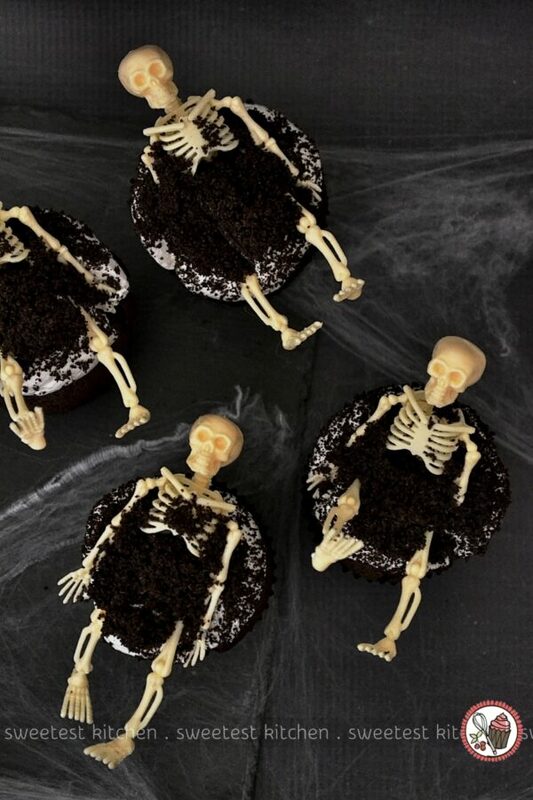 What’s so great about these ghoulish little cakes is that they’re so easy to make, which is perfect for a last-minute Halloween party. They’re not over-the-top creepy (have you seen some of the really icky Halloween treats out there? Wow!) and are decorated with simple dollar-store skeletons. And with some fake spiderwebs and spiders, and tombstones, too (which I don’t have), you can easily create your own spooky graveyard! These cupcakes are made from my go-to chocolate cake recipe, which is a simple wacky cake (just as easy as preparing a boxed cake mix) and frosted with marshmallow frosting (ie, 7-minute frosting). The dirt on top is made from Oreo crumbs. 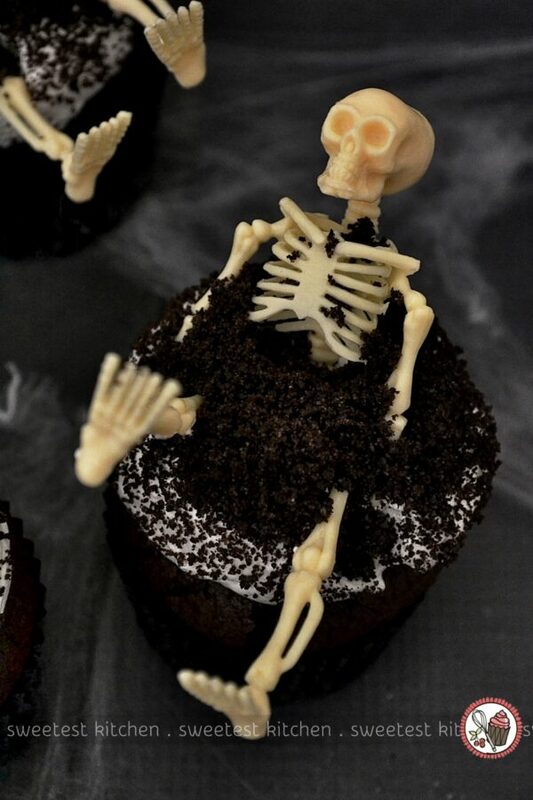 I haven’t made any great Halloween treats for a couple of years, so I hope these skeleton cupcakes will make up for that! If you’re looking for more spooky treat ideas, be sure to check out my zombie cupcakes – the chocolate ones and the red velvet ones, my pumpkin and dulce de leche spider cupcakes, and my green witch finger cookies. These Halloween chocolate cupcakes with marshmallow frosting are easy to whip up for your Halloween parties. For the frosting: In the heatproof bowl of an electric mixer, set over a saucepan of simmering water, combine sugar, corn syrup, ¼ cup water, and egg whites. 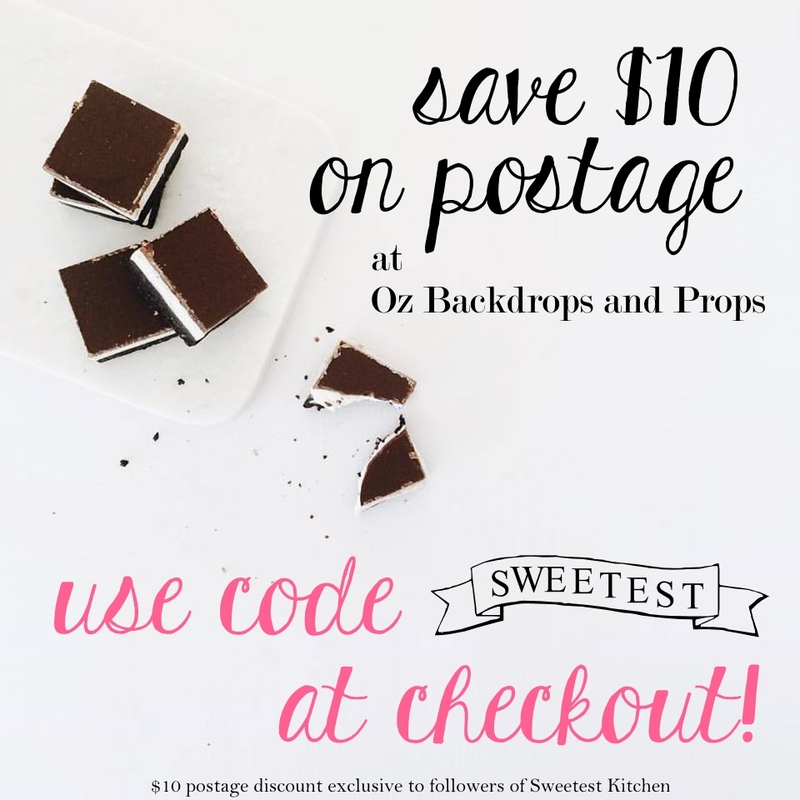 Cook over medium heat, whisking frequently, until mixture registers 160 degrees on a candy thermometer. Attach the bowl to a stand mixer fitted with the whisk attachment. Beat mixture on high speed until glossy and voluminous, 3-4 minutes (do not overbeat). Beat in vanilla. Pipe onto cooled cupcakes as desired (I used a large round tip). Process Oreos in a food processor until they are ground into fine crumbs. 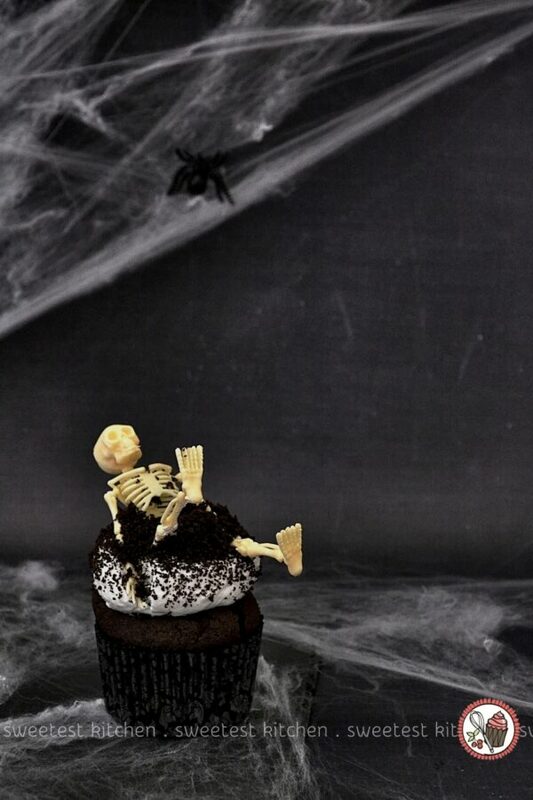 Sprinkle the crumbs over the frosting and decorate with your Halloween decor. * If you don't have access to light corn syrup, you can substitute with glucose syrup.